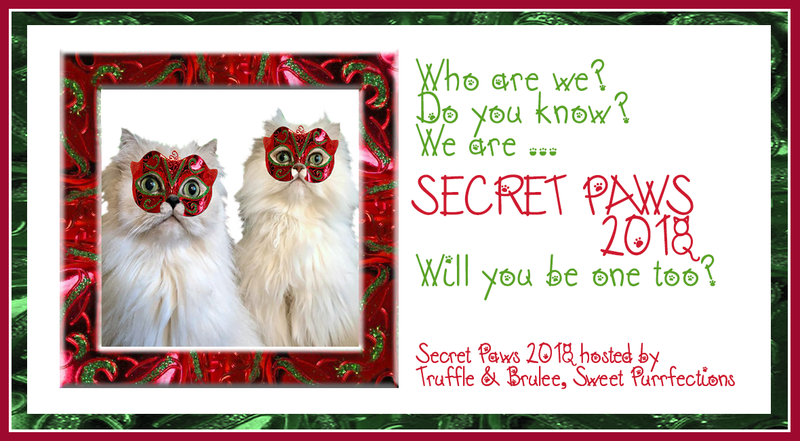 Secret Paws 2018: Our Secret Paw! 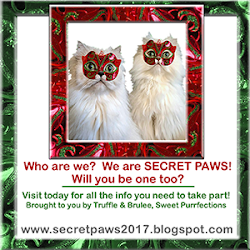 First, we want to apologize for taking so long to post our great Secret Paw presents. We would trade Mom in for a new Mom but then we would have to work on training the new one. We think it's hopeless. 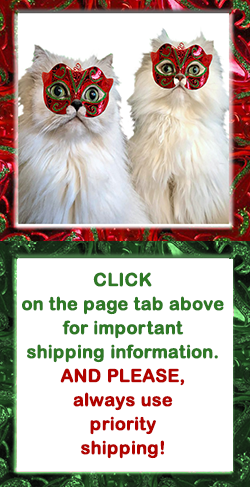 Anyway............Our Secret Paw presents came from Cody and Caren from www.catchatwithcarenandcody.com. We received the package from Amazon and everything was gift wrapped in GORGEOUS sparkly bags. Mom is saving them because she said they are soo beautiful! She is going to find some way to re-use them!! Here's a slideshow we did of us enjoying our gifts! Mom tried to get an action shot of Allie with the fev-ver toy but Allie wouldn't cooperate!! Many thanks for the pawsome presents! Mom's been wearing her socks a lot since we've had some cooler temps and they make her feet feel cozy and happy too!! 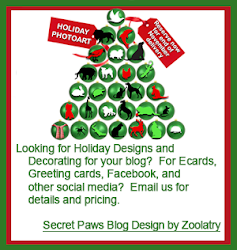 Secrete Paws sounds like a wonderful thing! ohhhhh nooooooooo!!! I thought there were THREE stockings!!!! OMG...I have to make it up to you! Thank you so much for posting, your video was darling! There were.....Allie focused on the fev-vers! What a pawsome Secret Paws package! Please take this badge and feel free to display on your blog!